Posted on October 25, 2015 by Lydia / This entry was posted in Informative. Bookmark the permalink. Nag Champa is the world’s most popular incense, containing sandalwood, a semi liquid resin “halmaddi” taken from the Ailanthus Triphysa tree which gives it the characteristic brownish gray color and damp texture. The incense is also made from the combination of flowers, resins, essential oils and herbs which are all natural and free of toxins. The name of this incense is derived from the champa flower. The distinctive scent of Nag Champa is commonly used for incenses, aromatherapy, oils, candles and soaps. In ashrams and yoga studios Nag, used in the form of incense, is used to promote a calm feeling and has been thought to facilitate meditation. The plumeria or frangipani flower gives this incense it’s sweet scent. Nobody can truly trace, beyond folklore, from where this incense may have possibly originated. But the ingredients are mostly found in Nepal and India, most likely it was originally harvested by ancient peoples indigenous to these areas. 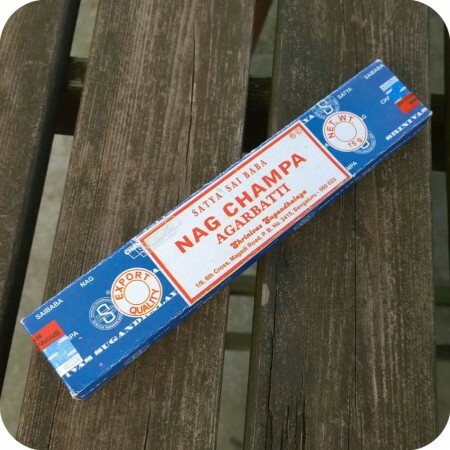 Nag Champa was then brought to, and inevitably manufactured by, Hindu and Buddhist monasteries in India and Nepal. The secret formula of this incense remains secret to each monastery. When Westerners were in search for spiritual enlightenment during the 1920’s and again in the 60’s, they traveled to India where they found Nag Champa. This was how Nag Champa incense began to spread all over the world, many of whom also burn incense for spiritual and meditation purposes. The Champa flower is considered as a sacred plant cultivated in India, Vietnam, and certain parts of China and India. Other ingredients include sandalwood, and Halmaddi, Cinnamon, French lavender, black pepper and ingredients found locally, also this depends greatly upon the maker’s choice. It is a belief that the scent of Nag Champa alone can enhance the meditation of spiritualists, and creates a sacred atmosphere. The incense is also used in the morning prayers, religious ceremonies, and special events as well, and is also used in some instances for air purification and creating certain moods. The act of lighting and spreading the incense throughout a domicile is said to stimulate spirituality and meditation. The scent will linger in your memory long after it has burnt out, helping to eliminate negative energies and then replenish the surroundings by positive energy.